The mastermind behind that wager — the White House adviser who convinced Trump to visit Saudi Arabia for his maiden foreign trip and who choreographed a veritable lovefest between the new American president and the desert kingdom’s white-robed ruler, King Salman — was Jared Kushner. The presidential son-in-law has carefully cultivated a close partnership with the heir to the Saudi throne, Crown Prince Mohammed bin Salman, whom Kushner has championed as a reformer poised to usher the ultraconservative oil-rich monarchy into modernity. But the U.S.-Saudi alliance — and the relationship between Kushner, 37, and Mohammed, 33 — is now imperiled by the unexplained disappearance and alleged gruesome murder of Jamal Khashoggi, a Saudi journalist who had been living in the United States and wrote columns for The Washington Post. The suspected killing has sparked international outcry and calls for tough punishment of Riyadh. Kushner, however, has already signaled that he has no intention of turning his back on the crown prince, known by the initials MBS. Trump himself has threatened “extreme punishment” even while repeatedly casting doubt on the Saudi regime’s guilt or the effectiveness of tough measures. “It’s placed President Trump and the administration now on a tightrope and we will see how they perform,” said James C. Oberwetter, a U.S. ambassador to Saudi Arabia under former president George W. Bush. Trump and Salman together convened the leaders of 54 Muslim leaders to jointly condemn terrorism at a Riyadh summit in May 2017. And the Saudis built a center to combat extremist ideology, which Trump inaugurated during his trip by placing his hands on a glowing orb. Kushner has celebrated Mohammed’s moves to modernize Saudi’s economy and long-repressed society, including allowing women to drive and encouraging women’s entrepreneurship. Furthermore, he considers the crown prince an influential and wise sounding board on geopolitics in the Muslim world and holds out hope that the crown prince might eventually deliver support from Saudi Arabia — home of the two holiest sites in Islam — for his foundering Israeli-Palestinian peace plan. “I have a sense that they put all of their chips on the hope that the Saudis would be able to help the United States, not only in dealing with the challenges of terrorism, but also in dealing with peace in the Middle East,” said Leon Panetta, a defense secretary and CIA director under former president Barack Obama. Khashoggi, who wrote columns critical of Mohammed, is said by Turkish authorities to have been killed and dismembered inside the Saudi Consulate in Istanbul. In conversations intercepted by U.S. intelligence, officials in Saudi Arabia discussed plans to lure Khashoggi back to his native Saudi Arabia and detain him. The plot, U.S. intelligence officials believe, was ordered by the crown prince. Kushner was not briefed about the plot before Khashoggi’s disappearance, according to two people familiar with his knowledge of the matter. It would not be automatic for a senior White House adviser to be briefed on every new piece of intelligence in a region, unless officials decided it needed to be elevated to their attention, former national security officials say. Critics of the Trump administration say Kushner has been dangerously naive to trust Mohammed and has allowed himself to be manipulated by an ascendant monarch who charms foreigners yet has been ruthless in consolidating power inside the kingdom. U.S. intelligence officials who have been warily watching Mohammed’s rise since before he was appointed crown prince in June 2017 said they assessed him as a naive, inexperienced and ambitious upstart who was not prepared for a position of great power. They said they heard an echo of Mohammed in Kushner. Here, too, was a young, power-hungry “prince” with no track-record in government. Administration officials said that since those early months, Kushner has had key national security officials present for his conversations with Mohammed or he has later briefed them. “Jared has always meticulously followed protocols and collaborated with colleagues regarding the relationship with MBS and all of the other foreign officials with whom he interacts,” said a White House official who spoke on the condition of anonymity to discuss Kushner’s practices. Nevertheless, anxiety among some American spies grew when they learned that foreign officials in at least four countries had privately discussed ways to manipulate Kushner by taking advantage of his complex business dealings, financial difficulties and his lack of foreign policy experience, according to current and former U.S. officials familiar with the intelligence about those discussions. One of the countries was the United Arab Emirates, a key Saudi ally. Kushner sold Trump and administration colleagues on the idea that Mohammed, like Kushner, was a reformer looking to shake up old alliances and break up corrupt power blocs within his country. 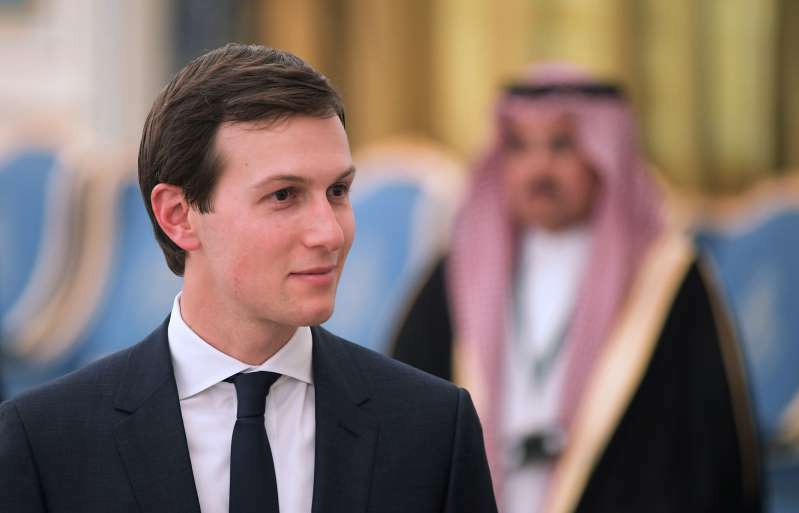 Kushner privately argued for months last year that Mohammed would be key to crafting a Middle East peace plan, because with his blessing, much of the Arab world would follow, according to people with knowledge of the internal deliberations. Tillerson, as well as Defense Secretary Jim Mattis and others in the U.S. government, was skeptical of Mohammed’s follow-through and of Saudi promises to help the United States counter Iran’s influence and destroy the Islamic State, according to the people familiar with the deliberations, who requested anonymity because they were not authorized to speak about them to reporters. Trump put Kushner in charge of drafting a peace proposal for Israel and the Palestinians both because of his long ties to Israel and because his authority as a Trump family member would be readily understood in Arab family dynasties, such as in Saudi Arabia. This past July, however, the Saudis delivered a setback. After the Trump administration recognized Jerusalem as the capital of Israel, King Salman publicly rejected Kushner’s peace plan and reassured the Palestinians that Saudi Arabia would not make the concessions that the United States sought for Israel. The plan stalled and Kushner was startled and angry at the Saudi response, according to diplomats familiar with his reaction. Trump is expected to soon present a reworked package, but it is not clear whether the Saudis would provide the diplomatic backing and financial support that Kushner has sought. “It all smacks of a massive naivete on his part that he could sit down with MBS and figure out Middle East peace and a broader framework” involving Arab states that want a durable solution, said Thomas Wright, a senior fellow in the Project on International Order and Strategy at the Brookings Institution. The administration voiced little public criticism when Mohammed seemed to overstep with the detention last fall of leading Saudi businessmen and a bizarre episode involving what may have been the brief kidnapping of the Lebanese prime minister, nor when the Saudi crown prince picked a diplomatic fight this year with Canada, a close U.S. ally. In general, Trump’s critics have said the president’s admiration for strongmen and reluctance to champion human rights and democracy makes authoritarian leaders feel empowered because they do not fear American retaliation.